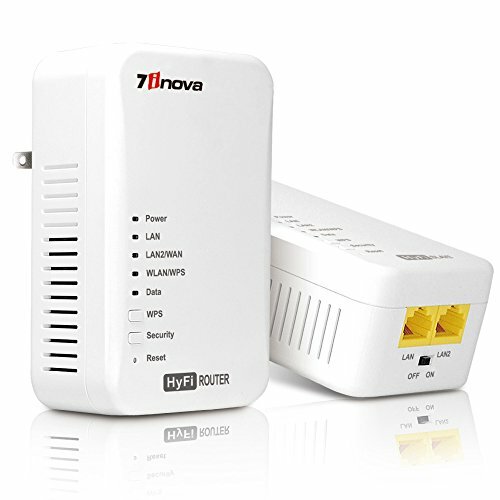 7inova™7WHP550KIT HyFi Wirless Smart Network Start Kit(Wireless Powerline Router Master/Add-On Slave with Plug and Play) by 7inova at AABX. MPN: 7WHP550KIT. Hurry! Limited time offer. Offer valid only while supplies last. HyFi network start kit consists of: HyFi (Hybrid WiFi)master(7WHP550M Wireless Router) HyFi (Hybrid WiFi)Slave(7WHP550S) How HyFi Works? 7WHP550M-HyFi wireless router: It is a complete functional wireless router in itself. Be equipped with 1XLAN, 1XWAN ports, it supports Dial-Up, DHCP, STATIC IP way, can access internet via wired&wireless. 7WHP550S-HyFi wireless slave: Be equipped with 2XLAN ports and also wireless function, It connects with 7WHP550M via powerline, can access internet via wired&wireless also. Kindly Reminder:HyFi starter kit need to work within same phrase meter. 7inova warrants Hyfi product against defects in materials and workmanship under normal use for a period of ONE YEAR from purchase date. Not sure how to get HyFi products work? contact our customer service team now to assist. [ROUTER/EXTENDER IN ONE] The master works as a wireless router, the slave extends network coverage via powerline tech, add on and play. [EXTENDING, NO HASSEL] Ideal for extending more powerline and increase network coverage to hard-to-reach areas in the home. [ETHERNET/WIFI Flexible OPTION] Both master and slave work wireless, each also has two ethernet ports for connecting devices such as TV, game consoles and PCs. [SETUP IN MINUTES]Setup the master as wireless router, the slave no need setup, add on and extends netowrk coverage. [FAST SPEED] Wired speed up to 500mbps, wireless up to 300mbps for large-free HD vedieo streaming and online gaming.